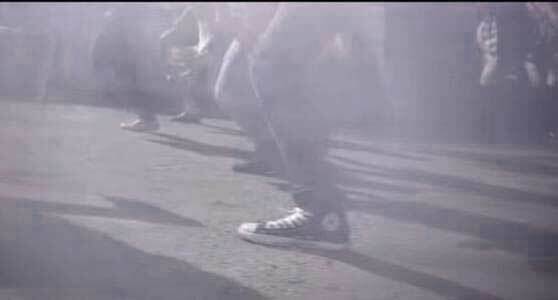 Chucks have long played a defining part in music. They help make an artist’s image and set the tone for many music videos. Realizing this, Converse created their Rubber Tracks series. They describe it as “a global family of community-based professional recording studios” that allow emerging musicians of all genres to get free studio time while maintaining the rights to their own music. They also pair artists with filmmakers and directors to help film their music videos. It’s a great program and it allowed the creation of the song “Nobody’s Fool” by Black Spade which is accompanied by a music video directed by Logan Roos and Adam Porter. Protester running into the line of police. 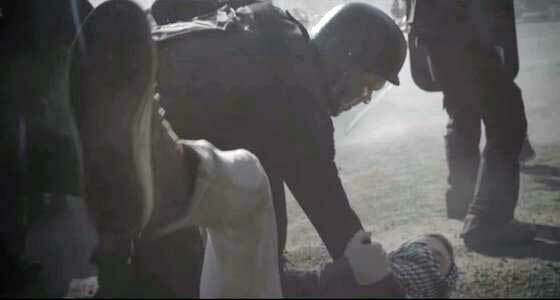 A protester being thrown to the ground. 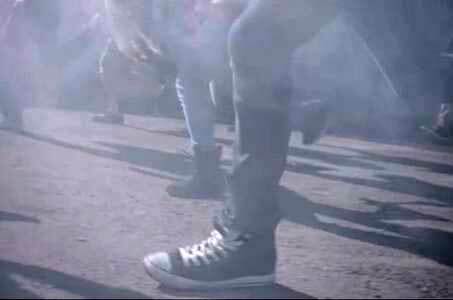 The video was produced by Converse as part of their Rubber Tracks series on YouTube. It features Black Spade in an abandoned warehouse sitting in front of what looks like a HAL 9000 computer. Outside the warehouse, we see a clash between protesters and police. Many of the protesters are wearing chucks, which give the scene more weight and realism as we see them being pushed around and tossed to the ground. Eventually, the police make it pass the protesters and break into Black Spade’s warehouse. They come to find out however, that he is not actually there. That HAL 9000 looking machine is actually a projector that is projecting a hologram of Spade. It was all a clever ruse. The video very much fits the tone of the song. The scenes between protesters and police are shot in slow motion so they gel well with the ambiance of the beat. It also plays into Black Spade’s lyrics about being a rebel for all the wrong reasons. It’s a very visually stunning video and it definitely helps elevate the song. The iconic Chuck Taylor is the shoe of the rebel. Get a new pair of chucks to make some Rubber Tracks in by clicking on the links below.